I’m often asked what cruise line I like best…and why. Truth be told, I don’t have a “favorite” cruise line, but I do have cruise line favorites. Meaning, each cruise line has its own unique features and amenities. It is this list of strengths that enable each cruise line to stand out from the leisure armada circumnavigating the globe at any given moment. This new feature, 10 Reasons Why, is a list of what I like best and what I feel are passenger-related strengths. 10 Reasons Why should be fun, interesting and hopefully hit some high notes to help you to decide what cruise line to choose for your vacation. To kick off CruiseMaven.com’s 10 Reasons Why, I’m going to begin with Holland America Line. I’ve sailed on Holland America ships quite a bit in the last few months so I’ve been able to track consistency within a short period of time. Here goes: 10. An Evening at Le Cirque in the Pinnacle Grill specialty restaurant. Under the guidance of Master Chef Rudi Sodamin, Holland America already has a winner with their award-winning Pinnacle Grill restaurant aboard all of their fifteen ships. Now, in a new collaboration with famed restauranteur and founder of Le Cirque Restaurants, Sirio Macciono, at least one night during a cruise, the Pinnacle Grill is transformed into an at-sea version of New York’s legendary Le Cirque restaurant. Every facet of the dining experience, from menu creations, wine selections, place settings and the restaurant ambiance all work in together to recreate a true Le Cirque dining experience. Even the incredible Crème Brûlée was as close to the real deal at Le Cirque as I remembered from a few years back. Not to be missed, if it’s in your budget. $79 per person for the dinner. Wine is additional. 9. 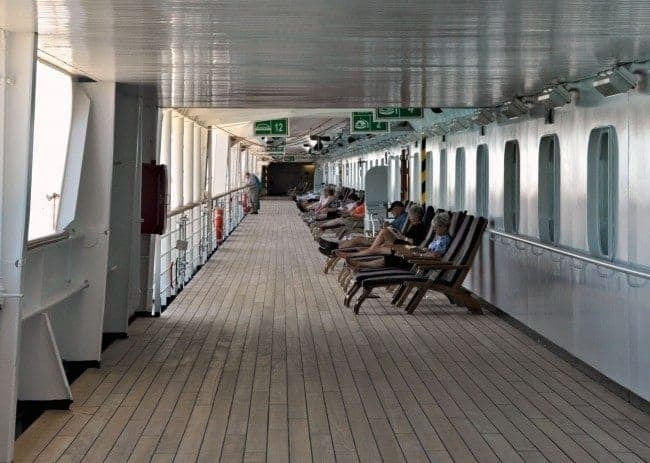 The traditional wrap-around Promenade Deck. With so many new super-huge ships appearing on the scene, it’s a wonder how the cruise lines manage to pay for them. One way is to do away with public spaces and install more cabins and more pay-per-use (i.e. nickel and dime) venues to increase revenue. While that is all lovely and nice and a sure money stream, it’s nice to see that one cruise line is keeping with seagoing tradition. Holland America Line can boast of having a wrap-around promenade deck on all of their ships. Not just a narrow outdoor passageway or a walk-around interjected with mandatory stair climbing. This wrap-around teak deck is as wide and open-air as promenades were in the days of the grand ocean liners. 8. On Deck For the Cure. Once on every cruise, passengers can lace up their walking shoes and participate in the Susan G. Komen “On Deck for the Cure” 5K fundraising walk. This philanthropic event takes place where else, but on the beautiful Promenade. There is no speed record to be set, and it’s ok not to complete the 3.125 miles. There are water stations along the way, you don’t have to worry about veering off course and Rosie Ruiz isn’t there to short-cut through the doors from one side of the ship to the other. There are no winners or losers. It’s a great way to donate and get in some much needed exercise after eating your way through your cruise. The cost is $15 and you’ll receive an On Deck for the Cruise t-shirt and a pink rubber wristband. Holland America will donate at least 75% of the total donation to Susan G. Komen Foundation. Everyone likes a little pampering and special treatment. Suite guests are no different. So to give the Deluxe Verandah Suite and Penthouse Verandah Suite guests a place to call home, Holland America has the exclusive Neptune Lounge just for them. The Neptune Lounge offers a continental breakfast, snacks, hors d’oeuvres and refreshments at various times of the the day. There is a large screen television, plush chairs and sofas, a small library and it’s wifi-enabled. Similar in concept to Royal Caribbean’s overly popular and at times overly crowded Concierge Lounge for top-tier past passengers and suite guests. The Neptune Lounge is much more plush and low-key and from what I observed, has a larger selection of refreshments and light snacks than Royal Caribbean or even Celebrity. But then again, the Neptune Lounge serves only those in the highest suites, while Royal Caribbean and Celebrity offer this to a wider range of guests. For years, Holland America has always been thought to cater to the older guest. By older, I mean 65 and up. And up. Not so true anymore. On a recent Halloween cruise aboard the young Eurodam, the scene on All Hallo’s Eve looked more like Bourbon Street than a cruise ship. It was a partyer’s haven, but nothing raucous or rambunctious. Just amazingly clever costumes (more than a few Carmen Mirandas) and good times. Ok…I’ll admit it. I’m getting older with each passing cruise. I like to head back to my cabin before midnight and get there without staggering and bouncing off of the cabin doors in the hallway. So, while the demographic for Holland America may seem older than, say, Carnival or Norwegian Cruise Lines, it depends on the season, the holidays and your frame of mind. I’m tired of hairy chest and belly flop contests (though they can be fun to watch.) Holland America’s passengers are generally fun, well-traveled, young at heart and well-mannered and mostly over 50. I’m sure there’s something that your mom cooked that to you was the perfect comfort food, time and time again. Holland America has something similar with the rich and buttery Bread Pudding. Offered every afternoon at lunch, this is another reason why people enjoy returning to Holland America; for their favorite comfort food. This infamous and sweet Bread Pudding has been a staple in the Lido Buffet for as long as I can remember. Presented in a covered tray and accompanied by a slightly warm, light vanilla sauce, it’s nearly a food group unto itself. A $566 million investment to renovate, refurbish and enhance each and every ship with upgraded plush Euro-top mattress and high-count cotton bed linens, flat-screen TVs and bathroom enhancements ranging from deluxe bathrobes to lighted, magnifying make-up mirrors to new shower heads and granite counter tops. Public areas on some of the older ships now have the same lounges and show venues as their newer counterparts. What were once smaller, boxy public areas (bars, especially) have been modified and are now more open, have a wonderful traffic flow and a feeling of spaciousness. The new mattresses, called the Mariner Dream Beds, are as comfy and cozy as the top of the line bedding at any upscale hotel. This is probably one of my favorite features and it’s only offered on a couple of Holland America ships. They’ve gone the extra yard to create a very private area where you can rent your own cabana for a day or the entire cruise. 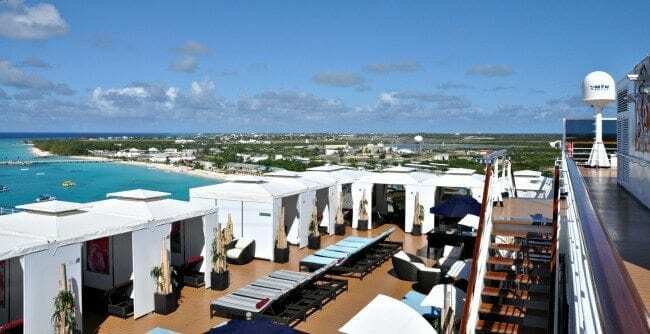 There are only maybe a couple of dozen of these highly sought-after cabanas on the Eurodam and Nieuw Amsterdam. For only $199/week, you can rent your own covered shelter on either the pool deck or overlooking the pool deck. You’ll get bar service, cushioned lounge chairs and a sort-of bed, fresh fruit, bottled water, clean towels and a sense of exclusivity. If you like to be outdoors but far from the madding crowd, this is the best deal ever. Think about. You can book an inside or oceanview stateroom to save money, and then rent a beautifully designed cabana where you can spend as much time taking in the sun and sea air as you’d like to do. This is truly a special feature and one that you need to reserve either online before you leave or immediately upon boarding. That’s my nickname for what I think is a stroke of genius by Holland America. During the first 48-hours of the cruise, self-service at the Lido Buffet is off-limits to all passengers. You’re not allowed to even pick up a plate! Everything is handed to you as you request it and then when you reach the end of the buffet line, you take your plate (or someone can assist) and enjoy your meal. This is such a brilliant idea that I don’t know why all cruise lines don’t adapt to it. It’s the first 48-hours that’s the crucial incubation time for Norwalk (norovirus.) By not allowing snotty, soiled hands grabbing the serving utensils or the tantalizing fruit tart sans tongs, so much of the spreading of germs is certainly avoided. And my Number One favorite reason to sail Holland America? 1. You can get a full breakfast from room service on debarkation morning! Debarkation morning is always stressful. Last minute late night packing, organizing and settling accounts and then to trudge up to the Lido Buffet or sit patiently in the main dining room isn’t my preference. It’s such a relief to put the hangtag breakfast order on the doorknob at night and know that I can still have a somewhat unfettered couple of hours in my cabin to enjoy my coffee et al. Eggs, lox and bagels, croissants and fresh OJ and coffee – it’s a full menu, not just a roll, a pat of butter and lukewarm coffee. Saying goodbye to your ship is tough enough. Having a nice breakfast in your cabin or on the verandah at the end of your cruise eases the passage from vacation to home. Delighted to see this list! We’ve cruised with HAL 4 times, and don’t even really consider other lines. Our preference is for the smaller ships and better staff-to-guest ratios. We’re also not interested in skating, rock climbing or playing miniature golf on a cruise; we like what HAL has to offer on board. One of our indulgences is to enjoy breakfast in our suite every morning. SO nice to have your meal and hot, fresh coffee delivered to your room, allowing you to partake at a leisurely pace while enjoying the view outside. We’ve also been very impressed with the crew’s obviously genuine desire for us to have an enjoyable cruise–outstanding service every time! Thank you for your comment. You’re right…Holland America’s crew is extremely attentive to seniors (and “Juniors” too!) and that’s why I’d suppose so many over 55ers appreciate HAL. If it is reassuring, I’ve met couples in their 90s on Holland America so keep those suitcases within reach for a long time! My hubby and I also love the Holland America line as they cater to the older crowd and they’re not swinging party boats. At our age, (70’s) we prefer the smaller ships and the peace and quiet. The crew have always been very friendly and accommodating. We hope to be able to go on at least one or more cruises per year while we can. Thanks, Sherry. WOW! 5 times in 12 months! A lot of fresh air. the ships. I love it! Thank you for taking the time to read the Holland America article. I’ve sailed with them five times in the last 12 months and try as I might, still can’t find anything to complain about in any department. You certainly have had a very interesting maritime career. Yes, the smaller ships are wonderful and especially the ones that don’t feel like a trip to Vegas. Happy cruising to you, too! Enjoy the Statendam. I’ve heard some wonderful comments about the ship. And I know! I started my seaman’s carreer on the New Amsterdam (blt.1938), leaving from Rotterdan as a cadet in August 1949. These were the days. About 1,200 passengers and 700 crew. So I know the feel. I am still working as a Maritime adviser but once a year I take a short trip. This time I chose the Statendam coming up July 29th and you will understand why i always like to choose HAL !!!. I like this type vessel better than the “Las Vegas” type. Just relax. Hope you make many more nice trips with HAL. God bless. Nice to hear from you. I couldn’t agree more with your own top 10 reasons. Thanks for taking the time to write such an engaging comment. My husband and I prefer Holland America over every other cruise line. We have sailed almost 600 days on their incredible ships to ports all over the world. Our #1 reason to sail with HAL is the crew; #2 is the music to dance by in the Ocean Bar; #3 is the Pinnacle Grill; #4 is the size and layout of the cabin on the older ships; #5 is the quality of the food in the Lido; #6 is the quality of the food in the main dining room; #7 is the incredible selection of itineraries; #8 is the passenger/crew ratio; #9 is the first class treatment in every area of the ship; #10 is the old world ambiance…the feel of cruising like it used to be…rather than the feel of a floating Las Vegas casino hotel. Thanks very much for your nice comment. I think everyone raves about the Holland America crew. They are doing something right, for sure. Thanks for reading the article. I couldn’t have said it better. My wife and I have sailed on HAL many times and our favorite part is the crew! Thanks for reading my blog. I’m so glad we’re in agreement about Holland America. The crew and staff really go the extra yard for their guests. I hope you’re able to cruise with Holland America soon! Thanks for your comment, too. I fully agree with your 10 reasons for liking Holland America Cruise Lines. They certainly cater to your wants and needs. The crew does an excellent job of meeting all of your wants and needs and then some. We have plans on joining them again as soon as we can make the arangements. We were treated like we were loyalty! Love Holland America!